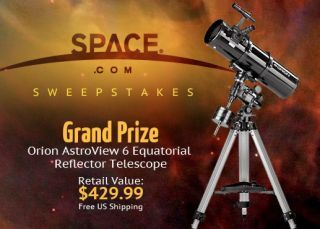 This telescope is just one of dozens of prizes available in the SPACE.com Facebook Sweeptakes. But hurry! It ends Jan. 16, 2012. Do you love space, but never got around to buying that telescope? Or perhaps a cosmic bomber jacket or meteorite are just the things that could make your Space Age collection complete? SPACE.com has launched a new sweepstakes on Facebook to give away T-shirts, bomber jackets and telescopes, among other great space-y prizes. The sweepstakes, available only to U.S. residents age 18 and up, ends Jan. 16, at 9 a.m. ET. SPACE.com Facebook fans can get another chance to win by sharing with their Facebook friends. Grand Prize: Three lucky participants will win an Orion AstroView 6 Equatorial Reflector Telescope. This versatile 6-inch reflector telescope includes a sturdy equatorial mount and tripod, with optics that provide great views of a range of sky objects, from the nearby moon to other planets and nebulas. A real-life meteorite: A 235-gram space rock found in Morrocco.